Lockheed Martin‘s Sikorsky subsidiary and Romaero have signed a partnership agreement with the goal to encourage Romanian defense companies to support in-country assembly and maintenance of UH-60 Black Hawk helicopters. Romaero said Wednesday Lockheed authorized the Bucharest-based aerospace company to host a regional center that will assemble, equip, customize and maintain the multimission aircraft in Central Europe. Eric Schreiber, a vice president of Sikorsky, said the manufacturer’s ability to provide a helicopter for surface combat and anti-submarine missions could help Romania maintain a “strategic position” in the Black Sea. Romaero and Sikorsky announced the industrial partnership during a ceremony held Wednesday at the headquarters of Romania’s ministry of economy. UH-60 is designed to support special forces, search and rescue, transportation and military logistics operations, medical service emergency and disaster response missions. 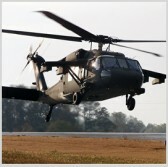 More than 4,500 Black Hawk units are currently in service with the U.S. armed forces and more than 20 foreign countries.